As it happened, today I stumbled across another free anti-virus software. I immediately thought I was in luck. Imagine finding more and installing them all. I would have the most well protected PC ever and free of charge! 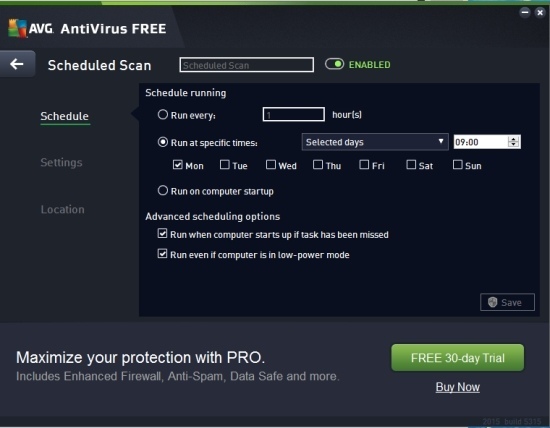 While this is not exactly the best solution, looking at the free edition of AVG Antivirus, you will realize that although its functions are limited, they could very well complement the ones of avast! 's free anti-virus. Either way, it never hurts to have more than one anti-virus software installed, right? Except maybe if you're worried about overall performance. Yeah... that's probably not the best idea. Still, do you care to discover what AVG is offering us for free? Step right in then! Starting up you will see some friendly large buttons that refer to each available feature that AVG AntiVirus FREE contains. You may click on "Scan now" to immediately begin a scan, or you can click on the cogwheel icon to create a more specialized type of scan. Once there you can create a scheduled scan that can run repeatedly by hour date or at start-up. This free version only allows the existence of one schedule, but you rarely need more than one if you're a regular user. The scan can also be customized to search for tracking cookies, root-kits and even old threats that pose no problem to modern operating systems (because who knows). Of course you may also scan specific folders or individual files if you wish and you can also adjust a scan speed slider to influence the scan speed (and how many computer resources it consumes). This last feature can be used even during a scan. Web Browsing Protection offers on feature in the free version. That is the LinkScanner Surf-Shield. Long name, I know. This basically deals with keeping you away from dangerous sites. You can turn it off if you wish, but that's it in regards to configuration. 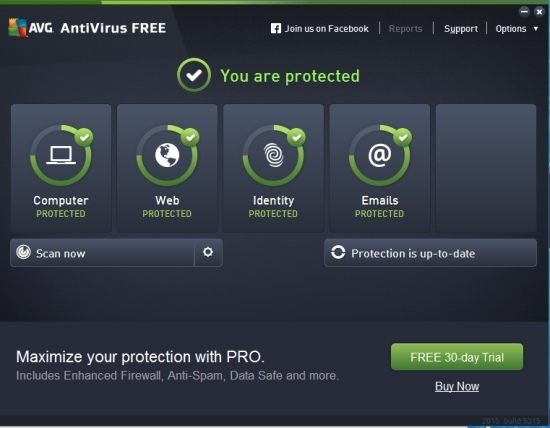 The most interesting feature of AVG AntiVirus FREE is most definitely the Identity Protection. Although the name does imply something else, this is essentially a real time protection for your computer. It monitors all active processes and if anything steps out of the line it is immediately caught and brought to your attention. From there you can decide what to do with it, similar to a threat found during a virus scan. That is you can delete it or save it in the virus vault. The last feature is the Email Scanner. If you use an e-mail client then every message that it receives will be scanned upon arrival. You can even instruct it to scan outgoing messages if you're sending questionable content. Scheduled scans - You can set up a recurring scan. Real time protection - It monitors active process and kills any that misbehave. I feel most safe knowing that Identity Protection and Email Scanner are hard at work while I can surf the web download and install stuff without a care in the world. Don't look a gift horse in the mouth, or so they say. There is actually nothing wrong with this package besides not getting everything. AVG AntiVirus FREE is a wonderful package. I might just fall in love with it and upgrade to the PRO version.